Pedi Care kit Natural Lemon 100g. 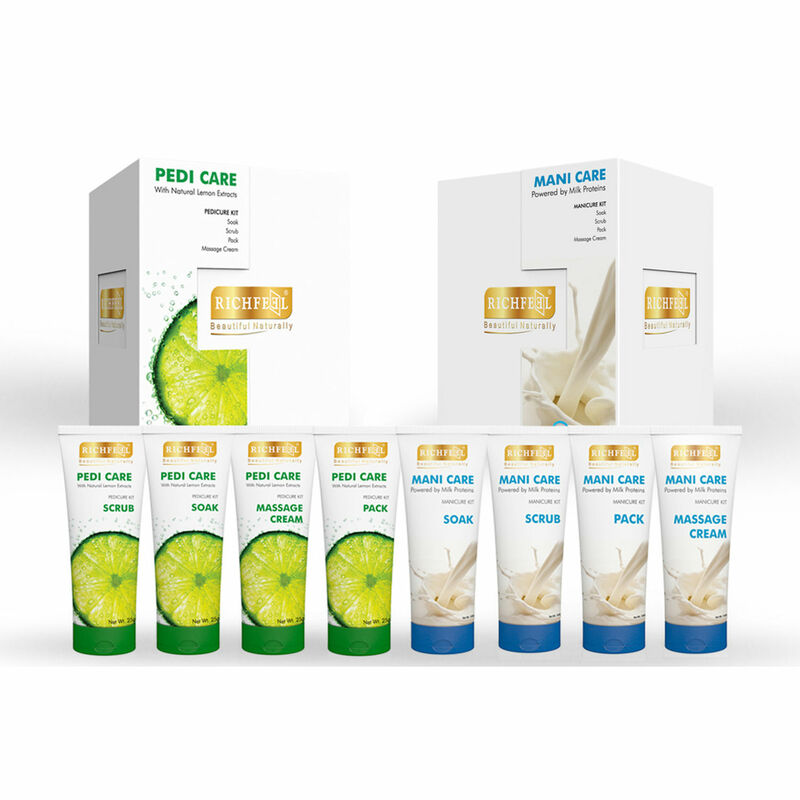 Mani Care kit Milk Proteins. pedi care - For all the weight they carry, your feet deserve to be rewarded. This time-honoured ultra-moisturizing recipe has been our favourite for many years. We combine nourishing and skin-brightening Lemon Extracts (super-charged with Vitamin C), gentle moisturizers and replenishing oils so that even the driest skin will stay renewed, soft and supple all day long. Dive foot first into this simple 4-step therapeutic kit for a soleful experience. Beautiful feet are now a reality!Your beautiful hands endure almost constant exposure to various irritants in the environment. mani care - Our assortment of products contain the nourishing and softening benefits of real milk proteins in a soothing and fast-absorbing formula that was developed specifically for your hands. The milk proteins penetrate deeply into the layers of your skin, helping it to retain vital moisture. As your skin begins to hold on to its water content, its elasticity gets strengthened. This allows your skin to resist the damage caused by the environment and protects your hands, leaving it visibly smooth and tender. How to Use pedi and mani care - 1. Shampoo – Pour around 8 gms into a small bucket of lukewarm water . Soak your hard-working feet or hands for 5 to 10 minutes. Rinse and wipe clean with a dry towel. 2. Scrub – Apply the scrub in circular motions (around 4 gms on each feet) for around 2 to 3 minutes, giving special care to cuticles and heels. Rinse clean to reveal fresh-looking feet that deserve to be flaunted. 3. Pack - Apply 8 gms of the pack on your feet for 10 to 15 minutes, rinse and pat dry. 4. Massage Cream – Squeeze around 8 gms of the cream onto your feet and massage it gently all over and well into the cuticles for 10 minutes. The cream will get absorbed into the skin and provide nourishment. One kit will allow for 3 applications1. Shampoo – Pour around 8 gms into a small tub of lukewarm water . Soak your hands for 5 to 10 minutes. Rinse and wipe clean with a dry towel.